In my Terraforming Mars review I made reference to this game, Through the Ages, and then realized I had not reviewed it yet. What the heck right? This is one of the main gaming highlights for my 2017 gaming year and I guess I was too busy playing it to actually write about it. Life can be funny that way. As an old school gamer who grew up during the rise of various PC strategy games, I was a big fan of the original Civilization. And what struck me the most about Through the Ages: A New Story of Civilzation is the fact that it does feel like a very clever tabletop version of that same computer game. It's not the official board game for the franchise, but it might as well be given how amazingly it captures that feel. This game changes lives for serious board game places, to use the probaby inappropriate term. It's just so darn good, but I recognize it's also not quite for everyone. 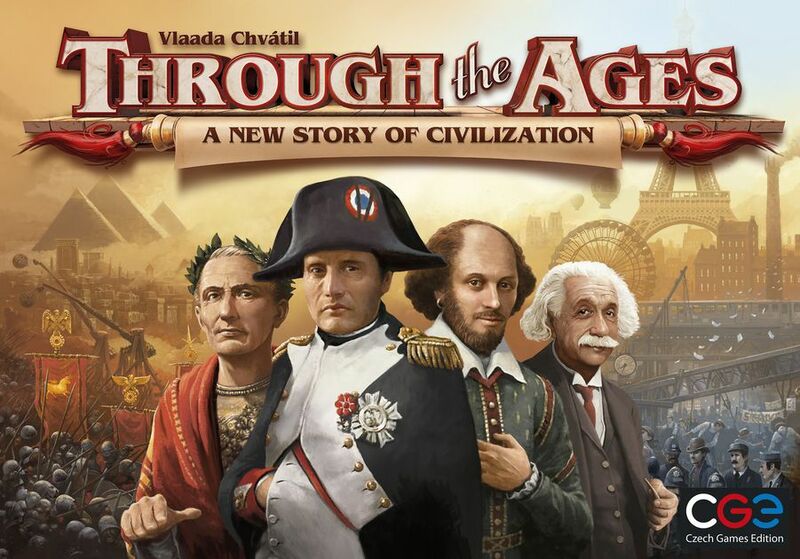 Synopsis: Through the Ages: A New Story of Civilization is a strategy card game for 2-4 players designed by Vlaada Chvátil based on Through the Ages: A Story of Civilization.Vlaada is also responsible for a variety of games that we also enjoy such as Galaxy Trucker, Space Alert, Dungeon Lords, and Codenames to name a few. Like the PC game Civilization, Through the Ages puts players in control of the rise (or fall) of their own civilization across the ages of history. You start in the Classical Era where you have card options including wonders like the Pyramids or leaders like Moses. The main control mechanism is that you get a limited number of Civic and Military actions per turn (4 and 2 respectively), which is modified when you change systems of government or research technologies like Code of Laws or Warfare. Ultimately the game is measured based on total Culture points one can accumulate and there are a wide variety of ways to gain points. You can go full military and try to use Aggressions and War cards to steal resources and eventually Culture points from other players. You can focus on your own civilization and maybe find a path to victory through technology or through sheer production. In the end your strategies will be shaped by the cards you manage to get and yet still have the actions and resources to make the most of. What I Liked: Apart from how much the game has captured a lot of the core principles of the Civilization games, the central mechanic for tracking resource production is crazily brilliant. You have a single board with a track for resources (which one? pretty much ALL of them) and matching corruption costs during periods of surplus, and another for potential population and matching food costs. It's hard to explain in a written review (or even in person) but once you understand how that works, the rest of the game nicely falls into place. And it's a very clever way to manage increasing production capability regardless of how "powerful" your civilization becomes over time. Then you have a crazy versatility off paths to victory coupled with good card diversity, delicate yet well thought-out game balance and all that good stuff. As much as every new player is bound to explore his or her own way to try to win, the random possibilitis of both the civic cards and the military cards leads to a near infinite combination off possible game outcomes. I enjoy trying out new tactics and styles every time we play. What Could Be Better: Admittedly the learning curve for this game can be pretty steep and even after investing a lot of time up front just to teach new players, stuff will inevitably slip through the cracks. The game is awesome precisely because of its complexity but that still acts as a barrier to entry for many players. And its frustrating not being able to get more people into this game. Then there's inevitable game length. The game estimates about 30 minutes at least per player but in my experience it's more like an hour per player, especially when they're more experienced and they put more effort into figuring out strategy it can get crazy long. We try to keep everyone moving as best we can but we still tend to clock at go over 2 hours for a four player game, more likely 3ish. It's a lot of time to invest in a single game when most game nights we try to play as many games as possible. TL;DR: Through The Ages: A New Story of Civilization is a complex strategy game that may be a little hard to learn but is totally worth it in the long run. It feels like Civilization but it's also a distinct experience that is uniquely rewarding among strategy games. Thus it gets a full 5 game-changing events cards that define how people play (and win) out of a possible 5.